The road to Laban Rata on Mount Kinabalu! Home/Climb Mt Kinabalu, News/The road to Laban Rata on Mount Kinabalu! The road to Laban Rata on Mount Kinabalu is around 4-6 hours, and offers amazing scenic views of Sabah’s Crocker Range mountains! 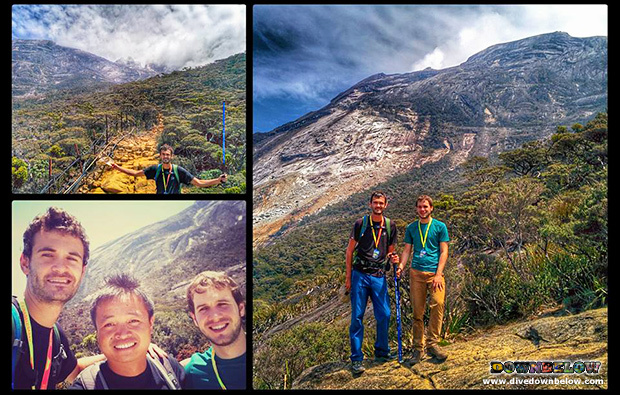 Arne and Laurens, from Belgium, climb to the Laban Rata plateau with their experienced mountain guide Bonnie. Along the Timpohon trail, the 3 reached the plateau with plenty of time to relax and explore the area at the 3272.7-metre altitude before their dinner at the Laban Rata resthouse. In their 2D1N climb to Laban Rata program, our Sabah Travel Centre experts recommended that they make the journey with walking poles to assist them on the ascent, and especially descent! Discuss a suitable itinerary for your climb with our experienced and helpful travel experts when you contact us, and receive pre-trip preparation. By Joanne Swann|2015-09-26T09:36:28+08:00September 22nd, 2015|Climb Mt Kinabalu, News|Comments Off on The road to Laban Rata on Mount Kinabalu!